Yesterday’s Sunday Times carried an article entitled “Regional accents thrive against the odds in Britain”. The journalist had interviewed the sociolinguists/phoneticians Paul Kerswill, Dom Watt and Clive Upton, which means that the article is strikingly well-informed as press reports go. Paul, however, writes that he was annoyed that they didn't mention his group’s London work, despite a long conversation about it. One thing that tickled me was a reported conversation between two high-profile Geordies, Cheryl Cole and Joe McElderry (məˈkeldəri, apparently). Note the intrusion into British demotic (“me and Cheryl were having”) of the valley-girl quotative be, like. “When me and Cheryl were having conversations in full Geordie, people would be, like, ‘It’s like a different language’,” McElderry said recently. Perhaps the most interesting thing, which is unfortunately not included in the on-line version of the report, was this map of British accent areas predicted for the year 2050. Not bad considering it’s the result of me making it up as I was talking to the journalist over the phone! I’m wondering what name we should attach to the unlabelled chunk of territory stretching from Lincolnshire on the east coast to the edge of the Birmingham/Coventry area. 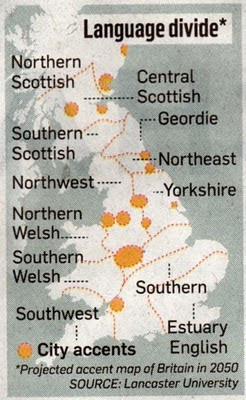 I’m also not convinced that north Norfolk people can properly be grouped together with Southampton and Bournemouth as “Southern”, nor Cardiff and Swansea separated from “Southern Welsh” and put in “Southwest”. The “City accents” shown, reading from north to south, are those of Aberdeen, Dundee, Glasgow, Edinburgh, Newcastle (Tyneside), Middlesbrough (Teesside), Leeds, Hull, Liverpool, Manchester, Sheffield, Birmingham, and Bristol. London is taken for granted, as the centre of so-called Estuary English. That region looks like an extended 'East Midland'. The map seems to suggest that 'West Midland' will be absorbed by 'Birmingham', so it might be simply 'Midland'. Yes. The focal points would obviously be Leicester and Nottingham. "Note the intrusion into British demotic (“me and Cheryl were having”) of the valley-girl quotative be, like." Interesting! But isn't the tag like part of the Geordie speech pattern in the first place? (Though perhaps it would normally have come at the end of the entire utterance.) Be for said is indeed pure Valspeak. But I wonder if the like made it easier for this Americanism to slip into Geordie. What I find interesting if slightly infuriating is the reader comments at the end. So much hate thrown at Britain's regional accents - "unintelligible", "child-like", "intolerable". One commenter thinks people speak as if their "mouth shapes were not properly developed", and another claims that the Kent accent has been "replaced by the harsh glottal stops of London". Really, the whole accent has been replaced by a single phone? So regional accents aren't legitimate, they're just deformations of the mouth. It seems to me that the writer misrepresents the grammatical structure of what you aptly term the "valley-girl quotative" by introducing a comma between "be" and "like." Certainly among Americans given to the use of that construction, the "like" in "People would be like, 'It's a different language'" is not analogous to the "like" in "They were, like, really confused." The "like" in the latter example is parenthetical and expletive (i.e., it's padding); the "like" in the first example is neither. "They were like 'It's a different language'" is not a padded-out way of saying "They were, 'It's a different language.'" The quotative use of "to be like" and the expletive use of "like" are grammatically distinct. 2050, television interview. Grumpy old man complains that today's youths drop their glo'al stops and if you use the decent "yesterdye" for "yesterdah" you'd get sacked from the BBC for being too posh. MKR, JW is happy with the comma between "be" and "like." So is Amy, who makes it more explicit by saying "Be for said is indeed pure Valspeak." I gather it is her business to know these things! I didn’t know where it came from, but I do know I heard 'was/were' for 'said' without the 'like' for quite some time before the 'like' became obligatory. 'Be' can behave in all sorts of funny ways: analysts of Belfastspeak have put forward "Up here was all bombs" and such as peculiarly regional or demotic, and I have adduced counterexamples like "the bathroom was all dirty nappies". Now that the 'like' in 'be like' has become virtually obligatory, it may seem that your grammatical distinction has a point, but for the present you can actually hear a pause corresponding in some people's use of this expression. corresponding to the comma, that is. Has there ever been a full study done of the Manchester accent? As far as I know, it's been ignored by academics. I think that Manchester is more like Yorkshire than like the Scouse accent, but Manchester and Liverpool are grouped as "North-West" on the map. On the map, it's not clear whether Newcastle is actually in the Geordie zone or not. The comma is possibly a mere artifact. I doubt that a pause before enunciation of the quotative "like" is very common and it remains distinct in meaning and origin from "like" used emphatically. I would have thought the two phenomena have met in single idiolects comparatively recently. The spread of Estuary English can only be described as horrifying. We are plagued with idiots on radio and television who speak English like the dregs of humanity. It may be that the twilight of spoken English - the Wörterdämmerung - is far too advanced. Is the appalling speech that buzzes about our ears today part of the general malaise? God forbid that it becomes standard English. Are standards not meant to be upheld? We must not slip into slovenliness because of a lack of respect for the language. Ours is a lovely language, a rich language, which has a huge vocabulary. We have to safeguard it. It is London of course, but debased London: slack-jawed, somnabulent (sic) London. One thing that the article misses as regards city accents is that some have changed completely as the demographics have changed. I've relocated this old article about how the traditional Bradford accent is virtually extinct (Bradford is the 13th largest city in the UK and has a very large non-White population). Yes, those West Country folk can keep their combine harvesters. And I'm disappointed by the prediction of the disappearance of the very distinctive Sussex accent. Yes leo, some of the reader comments at the end of that article were horrid, but John M has given a thought-provoking comparison with the horrors the loopos have been capable of unleashing in the past. Perhaps they are in retreat? Verbatim this was "Hopefully this may see the return of the correct pronunciation of words like "little" and "hospital". So many tv presenters pronounce it the way that they did when they were small children and their mouth shape had not properly developed." If he were a true pedant, surely he wouldn’t have said "hopefully". His use of it may actually show a bit of linguistic sophistication! But that is by the way. He is obviously not sophisticated enough to think in terms of the developmental aspects of muscular coordination or bases of articulation rather than 'mouth shape'. But the laterally exploded versions of "little" and "hospital" etc do require a certain articulatory sophistication the lack of which it is understandable for a listener of a certain age to be shocked by and find childish in a newsreader. I must admit that I too have been shocked by ˈfraɪknd, and fully expect to be shocked by 'lɪkɔ and 'hɒspɪkɔ, though I haven’t heard those from a newsreader quite yet, and as far as I know none of these are yet established as authentic dialectal or diachronic trends! At least he didn't call these perceived defects a throat disease, as I have heard Swedes call Danish all my life, including allegedly the Danes' own (half Swedish?) queen, Margarethe II. And I think you might give another of your citees a fool's pardon for complaining that a 'burr' has been replaced by a phone! The de gustibus of it is not disputandum. I know what he means by "the beautiful soft and gentle" being replaced by "the harsh". It may just be the green green grass of home, but I think not, since I find some accents and dialects either softer or harsher. But didn't you love the New York reader's comment "I know I will not rest until all native English speakers enunciate with pure classical English of the people of Brooklyn"? He may of course be one of those Americans of whom Bertrand Russell said they are convinced that if an Englishman wakes up in the middle of the night and finds his house is on fire, he starts shouting for help in an American accent! I think London (especially Inner London) should be separate from the rest of the "Estuary English" area, as there are different developments going on there than in the Home Counties (and even Outer London). I base this on very interesting things I've read by Kerswill, Torgersen and Fox. Also, can anyone tell me what the distinction between "Southern" and "Estuary English" might be? And why is the "Southwest" labeled as a separate region? I thought the distinctive rhotic accent of that region died out a long time ago, with the exception of Bristol. Thanks for your patience, as I am only a simple American who doens't understand the complicated linguistic situation in Great Britain, although we do have interseting developments going on here as well. What I wrote as "doens't" should of course be "doesn't". Is there any way I can go back and edit my posts? @mallamb: Ah, the fun of finding the pedants' mistakes, strictly according to their own rules, of course. They're nearly always there. @Anonymous. I think the "Southern" unit was just what they couldn't put anywhere else. Bristol is in the Southern rather than South-West section, but I can't see how Bristol and Norfolk can be linked. As Professor Wells pointed out in "Accents of English", many people in the Bristol area use the short /a/ in BATH words (including Glastonbury), but this would be rare in most of the Southern area. As John says, the focal points would be Leicester and Nottingham. But Leicester by then will have a population largely Asian in origin -- already 'indigenous' white school children are just another minority. And Nottingham will have a very large minority of Caribbean origin. Could it be that these two cities will develop accents more like those of other large ethnically mixed cities than that of the surrounding region?